Recipe: Lentil, Carrot and Ham soup. Hello everyone! Thanks for all of your lovely comments on my meal planning post. I mentioned in it that I like to make a big pot of soup once a week, and this is my favourite soup of all time. I love lentil soup, and it's so easy to make. I use my mum's recipe (or guidelines I should say, she never really has a proper recipe for anything). I tend to improvise a little on this so if you're a few grams short of lentils or you have more carrots to use up just go for it. Soup is simple and adaptable. These measurements make a pretty large pot of soup, probably a good 6 or 7 generous bowls in there so either half it or you can always freeze some for a super quick lunch as you can reheat soup from frozen. I use a hand liquidizer for this, they can be picked up for around £5 in Sainsburys and for me are a must have kitchen item. Carrot, lentil and ham soup. - 1 stock pot (optional but highly recommended - these stock pots are my cooking saviours, they add a richness you just cannot get with stock cubes alone). - 150g Shredded ham, you can shred ham yourself from a leftover roast or Sainsburys sells shredded ham hock in packs of 150g for £2.30/2 packs for £3. 1. Stick your full kettle on so your stock will soon be ready to go. Dice your onion and cook in olive oil until soft and lightly browned. Be careful not to burn, the onions are the base for your soup and if they are burnt your soup will taste burnt. 2. Peel and chop your carrots, add to the onions in the pan and fry for around 2-4 minutes on a medium heat to release the flavour. While the carrots are frying, make up your stock. I usually add around 2 litres as this is a huge pot of soup. I use only 1 stock cube because I add a stock pot at the end of cooking however if you are using only cubes then use two cubes in mixes of 1litre stock at a time. 3. After adding the stock to the pot, weigh out and add your lentils. Put the lid on your pot and cook for around 10-12 minutes on a low to medium heat. 4. Check with a knife to ensure your carrots are cooked, if not then leave the mix cooking for a few minutes more. If they are ready, take your hand liquidizer and go to work. Liquidise it all. I like my soup to be a little thick, but not too much. If you find this too thin, at this point you can add more lentils and cook for a few minutes then liquidize again until you are happy. 5. Once you have finished liquidizing your soup add the ham and cook for a further 8 minutes, stirring occassionally. If you're adding a stock pot then do so at this point. Season to taste and serve! Making life easier through Meal Planning - App review. Hello lovelies, it seems like forever since I posted on here. As well as working overdrive with the business lately, Ali and I have been spending any free time at all working on our home. It's coming together and look out for a home tour on here shortly. I have a little review for you today which I really enjoyed writing - and hopefully it will make your life a little easier! One of the things I've been struggling with since I started working from home is cooking. Now, I absolutely love cooking (and eating) but when you work in a kitchen all day, then spend a good while after work cleaning it, you really don’t fancy thinking about what to eat and it’s usually not until Ali comes home after 6 that I even give a thought to dinner. Oops, I've got loads of meat in the freezer but forgot to defrost any of it, we have no fresh veg, let’s get a takeaway. Having a takeaway more than one night a week is slightly soul destroying when you love to cook and aren't even really getting one for a treat any more but just for pure convenience. 1. Have a tasty home cooked meal 6 days a week. 2. Have less wastage because I only buy fresh food I know I will use. 3. Save money on that wastage and on takeaways. 4. Actually use my beloved cook books/favourite food websites for their intended purpose instead of just staring longingly at the photos in them. 5. Spend less time driving to the shop to pick up something quick to cook because I feel so awful at having had so many damn takeaway dinners! So, what I do. I sit down on a Monday (my day off) and go through either my recipe books or my favourite websites for recipes and decide on what we will eat for dinner each night of the week, then I go and do a weekly food shop. Not rocket science but it makes my life so much more simple. I’m not quite so good as to plan my lunches, but I usually have some of what’s left from the night before or something quick. Once day a week I will make a massive pot of soup and that does a few lunches. I’m also trying to recapture my love of baking as a hobby rather than just a job so I like to choose something to bake each week as well. The way I was doing this before was just on a piece of paper, which is fine, but meant a lot of flicking back and forth between pages and hoping I didn't miss out any of my ingredients on my grocery list. I was recently asked by Argos to collaborate with them on a review of some apps, and so I decided to give some food apps a go, trying them out on an apple ipad. These are a few that I really think are worth looking at. 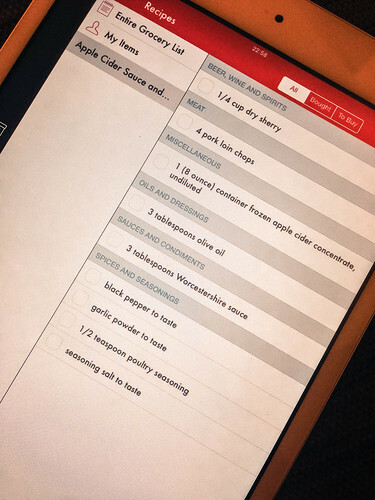 I've found using the iPad for my meal planning has saved me a lot of time and made me more adventurous with my cooking. I’m just going to dive right in with the complete package here. 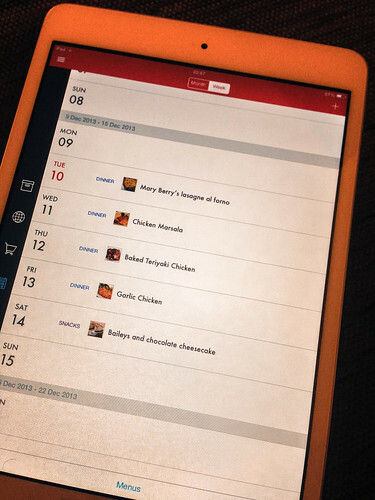 This app does everything you would need from a meal planning app. It is the bees knees, seriously. 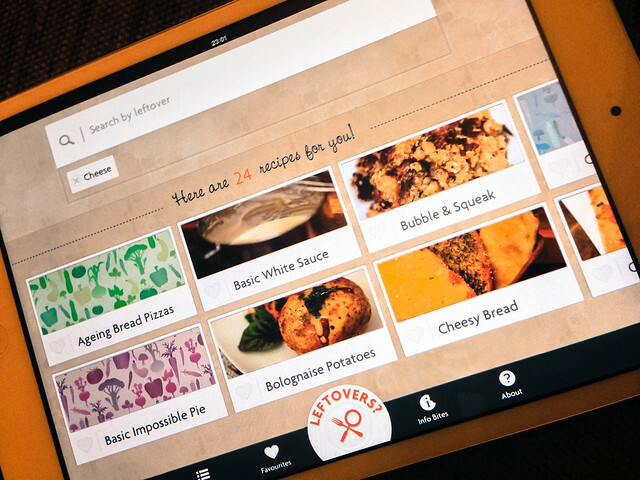 Described as a ‘recipe planning app’, it allows you to browse your favourite food websites within the app and add recipes to your favourites – adding details such as category and ratings. Once you have done this, you can move to the meal calendar section of the app and add in the meals for breakfast, lunch dinner etc for the next week. One of my favourite features of Paprika is that you can also easily and quickly compile grocery shopping lists from your chosen recipes. Conveniently, you can also view a list of top rated recipes by all users which is great for giving you some ideas rather than just starting by searching for ‘chicken’ as I am often guilty of doing. This way, you can easily widen your cooking repertoire without having to spend forever trawling through an endless list of samey meal ideas. The built in timer is also a godsend if like me, you have a habit of leaving things in the oven just a little too long. Paprika is available on iPhone, iPad, Mac, Android Nook and Kindle Fire and is priced at £2.99. 2.The eye candy – Look & Cook. For me, the selling point of this app how much it reminds me of flicking through the glossy photos in my cookbook collection. It’s one of my favourite rituals of cooking. Sure, my creations don’t always look just as idyllic but it is often what helps me choose what meals I’ll attempt! 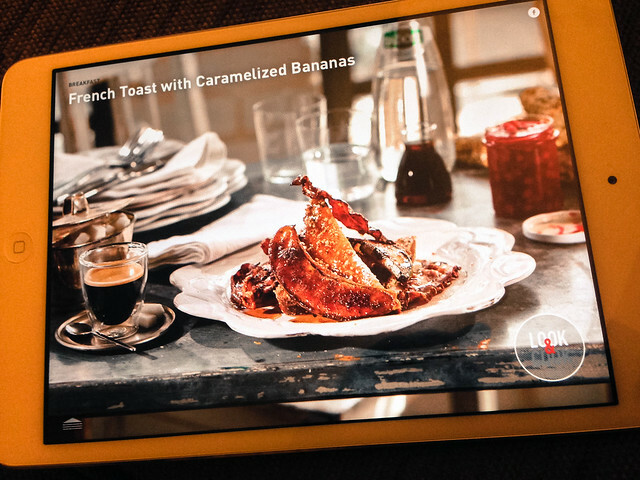 Look & Cook is incredibly simple to use, you select a category of food and are then presented with a ton of gorgeous photos to look through, with the meal name and details (serving size, time to cook etc) along the bottom. Although there are only 51 recipes within this app, they are all meals that would impress but are still on a pretty simple skill level. The photo is the main focus of your attention. 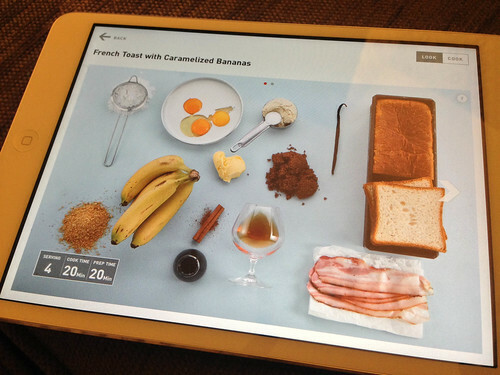 By then clicking on the meal you choose, you get a recipe and all the details you would need to feed those caramelized banana French toast cravings. 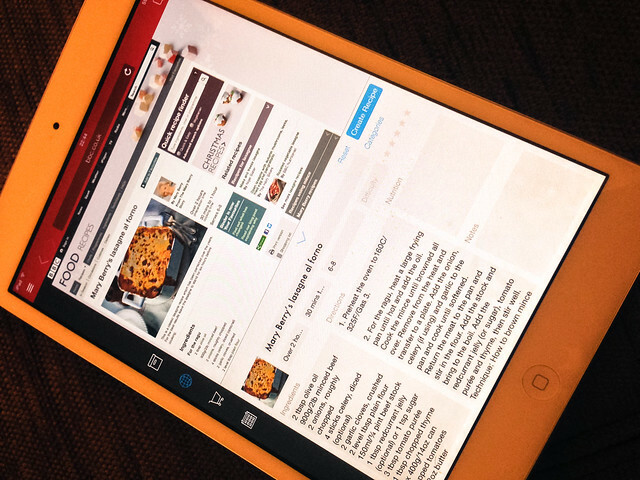 The app is sweet and simple, and also includes their ‘Clean Screen’ technology, if you are fed up covering your phone/tablet in food (mostly all of my cake books are covered in flour at all times), then you will love this. This is essentially a voice activation tool that allows you to follow the recipe without actually touching the screen. You can also switch the recipe from reading look to cook mode, increasing the text size so it can be easily read from the kitchen counter. Like Paprika, Look & Cook also has inbuilt timers. 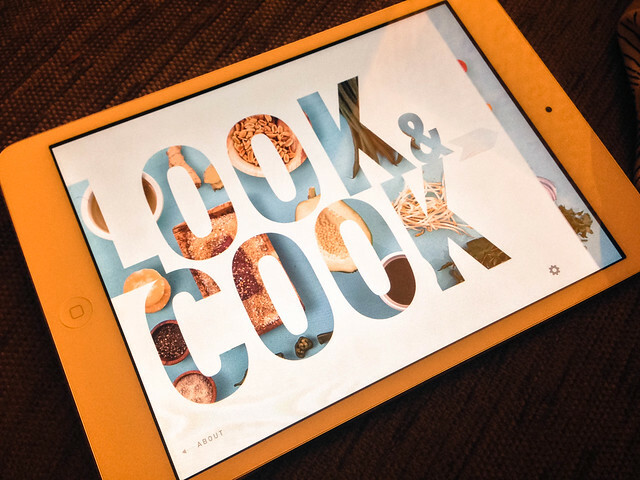 Look & Cook is available for the iPad, and is free to download (though their website does say that it is only free for a limited time). 3. The Money Saver – Love your Leftovers. 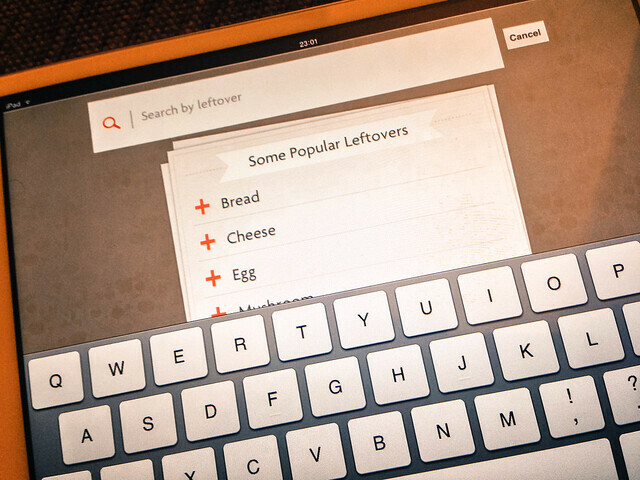 This is a wonderful little app that allows you to find recipes by entering what food you have that you need to use up. Although I like to only buy what I need, sometimes food comes in silly sizes so I have a lot of leftovers and this is a wonderful tool for finding something tasty to create with them. I use this lot for soup ideas, finding that if I have a lot of veg left over it will create a lovely pot of soup that can be used for lunches or portioned and frozen for another busy day! 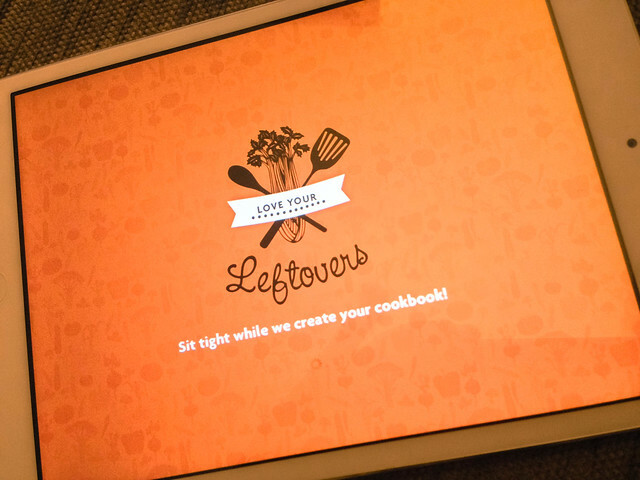 Love your Leftovers is available on iPad, IPhone, Ipod Touch and is free. 4. 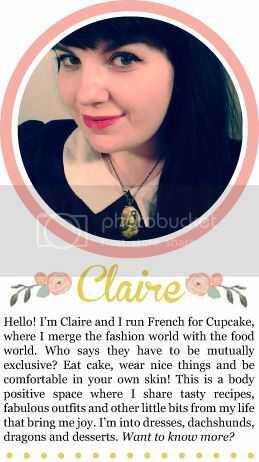 The little luxury –Primrose Bakery Cupcake and Cake Recipes. 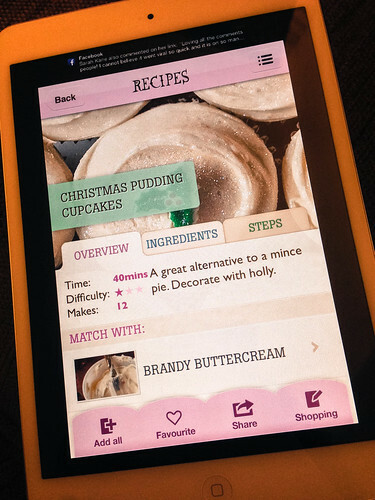 I’m a big fan of the Primrose Bakery cookbooks so this is simply an indulgence app for me. I’ve tried the majority of recipes in their books and never had a failure (at least not when I haven’t done something silly like forgotten to add the baking powder). It’s got nothing healthy in it, just cakes and sweet treats. Can’t complain about that! 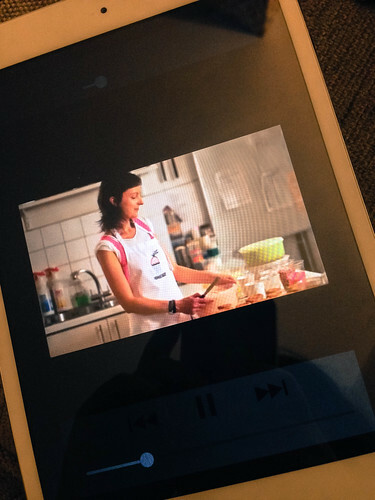 In this app you can find plenty of recipes for cupcakes, cakes, biscuits, icings – but the added bonus is the videos that come with it. 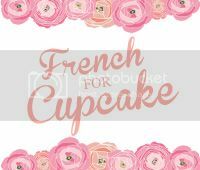 Simple and short video tutorials to show you how to frost your cupcakes, crumb coat your layer cakes and really practical guides such as how to make your own piping bags. 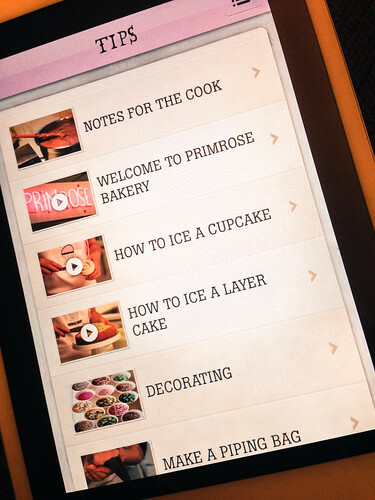 I love this little app, and really recommend it along with the Primrose Bakery cookbooks if you are a cake enthusiast like myself. 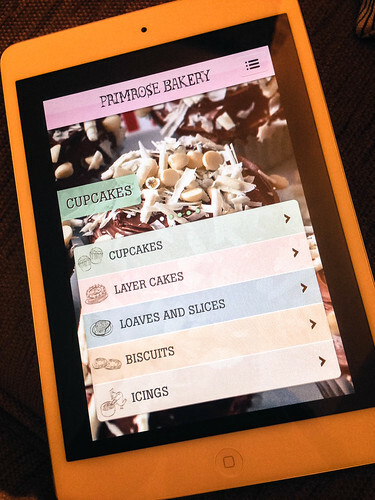 Primrose Bakery is available for iPad, iPhone and Ipod touch and is priced at £2.49. Thanks for reading! I hope you enjoyed the review and will check out the apps. I'm having great time trying new recipes and have a few to share with you in the next few weeks including triple chocolate banana bundt cake! Please note that this post was made in association with Argos.